f. 1r-17r: Copies of letters and abstracts. f. 17v-84v: Collection of poems, riddles, short prayers a.o. 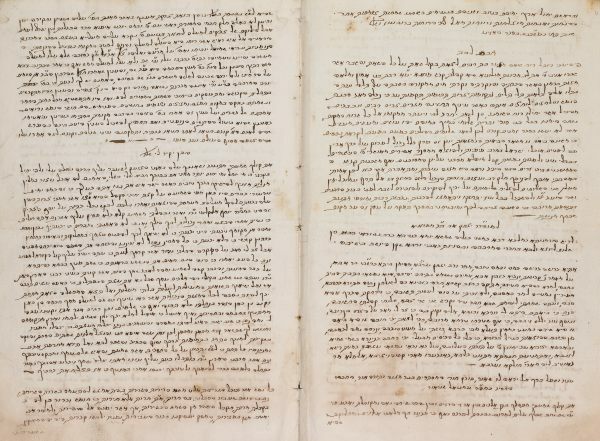 Among the copies are letters from Saul Levi Morteira, Isaiah of Trani, Yom Tov Tzahalon, Moses Dayan of Lemberg, Hayim Cohen, Menahem Habibi of Saloniki, Isaac Aboab, Judah Brill, Isaac, rabbi of Posen, Hananyah ben Menahem Cazes of Florence, Saul Aboab, Isaac Levi of Modena, David Altares and Benjamin Cohen. Hebrew / Paper / 28,2 x 19,7 cm. / 78 +  ff. / Variety of lines to a page / Italic cursive writing (autograph?) / No title.